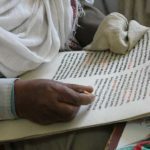 An ancient monastery in Northern Ethiopia has revealed the earliest known illuminated Biblical Gospel manuscripts. The Biblical scripts have not left the tiny monastery since they were written between 330 and 650 AD. This carbon dating was conducted in Oxford in late 2010. There had been a 1500-year old oral tradition associating the Gospels with a Syrian monk who sought haven in Ethiopia in the year 494. The monk had been persecuted with many others after the Council of Chalcedon. The texts are written in Geez – the ancient language that predates Ethiopia’s Amharic. The illuminations are Syrian. 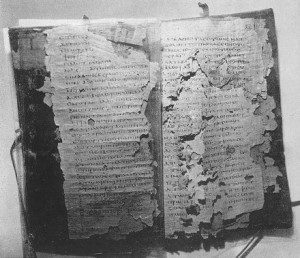 Even the oldest Syriac Gospel was only completed in 586. It is currently housed at the Laurentian Library in Florence, Italy. The Biblical script includes portraits of the four Evangelists, but most uniquely is a depiction of the Temple of the Jews. The ancient temples we visit in Ethiopia that were converted to Jewish Temples are now used as Christian churches. The covers of the Gospels were also found to be of importance. The first Gospel’s bookbinding was one of the world’s earliest bookbinding that is still attached to its text. It’s a copper covered wooden board, decorated with the cross, and holes where jewels were once inset. During our trip to Ethiopia, we had been told that the church had manuscripts that were only dated after 1100 AD. Oral history again proves true in this precious Christian country. The monastery is included on our Jewish and Christian tours of Ethiopia. Contact Rhonda Sand at Living Passages for more information on one of the study tours that include visits to the ancient manuscript sites, temples, and other Christian sites in Ethiopia. Check out the Ethiopia tours, or Christian tours in general, that Living Passages offers.